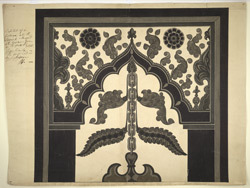 Indian ink and water-colour drawing of a capital of a column in the Golden Mosque (Sona Masjid) at Gaur (West Bengal) by William Francklin (1763-1839) in 1810. Inscribed on the front in ink is: 'Capital of a column at the Soonah Musjid at Gour - drawn on the spot A.D. 1810. Facsimile. The Original in my possession. W.F. Sung Moosah'; and on the back in pencil: '4'. The Great Golden Mosque or Bara Sona Masjid was built by Nusrat Shah about 1526 and is one of the largest buildings still standing in the ruined sultanate capital of Gaur in West Bengal. It comprises eleven entrances with three aisles and a verandah, four polygonal engaged corner towers and a spacious courtyard which is almost seventy metres in diameter. The building is faced in plain black basalt stone. The doors would originally have been framed by mosaics of glazed coloured tiles in floral patterns. This drawing shows carved details on a basalt capital from one of the piers that supported the roof of the mosque.